Mickey consults Yen Sid about the recent discoveries he's made. "Signs of What's Next" is the secret ending of Kingdom Hearts Re:coded. Like Blank Points, it uses game-engine graphics and voice acting and ends with the phrase Reconnect. Kingdom Hearts, but does not tease a future game, instead serving as a prelude to the events of Kingdom Hearts 3D: Dream Drop Distance. According to Tetsuya Nomura, the movie was originally planned to be longer, but due to space restrictions the video was trimmed while dialogue was added. 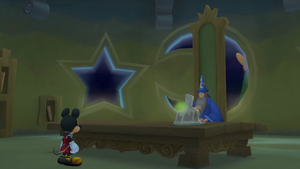 King Mickey and Yen Sid are seen mid-conversation in the Sorcerer's Chamber of the Mysterious Tower. Mickey says that they may have discovered the location of Ventus's heart, and Yen Sid concludes that the only one left to find will be Terra. Yen Sid foresees the coming return of Master Xehanort. Yen Sid then proceeds to openly wonder what Xehanort's next intentions will be. Mickey, however, is puzzled as to how Xehanort could even be around, as both his Heartless, Ansem, and his Nobody, Xemnas, have been destroyed by Sora. Yen Sid explains to him that in doing so, Sora actually freed Xehanort's heart from the Heartless, Ansem, and vanquished his left over body which had become Xemnas, and both halves have now reconstructed the original Xehanort. Not just that, but this will also inevitably lead to something far worse: the return of Xehanort's original incarnation, Master Xehanort himself. Mickey assures Yen Sid that he, Sora, and Riku will be there to counter Master Xehanort should he attack again, but Yen Sid explains that Sora and Riku are not powerful enough like Mickey, who is a true Keyblade Master, and furthermore, tells Mickey that one Keyblade Master alone will not be enough to face what is "not a single one of Xehanort". Before Mickey can question the meaning of this, Yen Sid orders Mickey to summon Sora and Riku to him to undertake a Mark of Mastery exam. Ansem, Xemnas, and Master Xehanort also appear as images. Note: In Kingdom Hearts HD 2.5 ReMIX, Signs of What's Next has no unlock requirements. ↑ This text is instead shown at the end of Kingdom Hearts HD Remix 2.5 secret ending, Destiny.